If the City Hall has its way, some 5000 land titles will be issued to settlers and other City Residents says NCD Governor Powes Parkop. Speaking to residents of Nautana community near Baruni in Moresby North West, Mr Parkop said yesterday that K4 million had been budgeted for surveying and subdivision exercise alone. He said the settlement upgrade initiative would be piloted in ATS, 9-mile, 8-mile, Nautana, Morata, Hohola Burns Peak, Kaugere, Ragamuga and Kipo. According to him, the quantity of titles would be increased when it is extended to others as well. 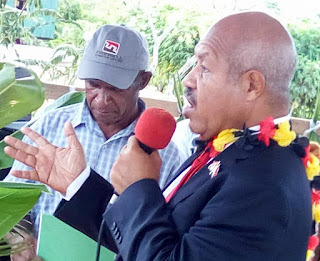 Governor Parkop, a key figure in the coalition government, commended Prime Minister Peter O'Neill for supporting this initiative. He added that the program would be rolled out in other settements next year and beyond. "Minister John Kaupa, Minister Justin Tchekencheko and I campaigned under this policy platform," he told cheering residents. However, former Housing and Lands ministers were not supporting the policy during his last two terms in office, he said. Governor Parkop further stated that they were serious in partnering with settlers to develop the city. They want to end common sight of settlements in the city and that settlement must become suburbs, he said. Parkop justified that settlers were the most strong and resilient people who-despite hardship and lack of basic amenities- alway work hard to make ends meet. "We must harness this positive and powerful energy to secure a better and greater City," he said. Parkop acknowledged that many working class people were pushed to cheaper accommodations in the settlements due to high rental and real estate price. He said he wanted to see this model being replicated in other major centres, adding this will empower fellow citizens to participate and engage in businesses in the formal sector and build a greater and more livable city. "We must enhance and promote our hardworking citizens. We also must give them a chance to improve their living standards," he said. Under the settlement upgrade program, he said, the settlers will have access to public amenities which have be been lacking for decades. Once the settlement too are properly surveyed, he said, land will be available too for other residents in the city so that they will be able to build their own houses. It will be a win-win, said Mr. Parkop. Jerry Duwoino, a seasoned settler of Nautana, was in tears of joy to express his gratitude to the governor and his other fellow MPs for the initiative. Community leaders Philip Nanga and John Miukin also shared similar sentiments.